The eighth installment in the popular slasher flick franchise, which is released seven years after the seventh chapter (which was said to be the last installment). It takes place ten years after the death of the Jigsaw killer, when a new series of brutal murders appear to be the work of the same deceased madman. It was directed by Michael and Peter Spierig (who also helmed the horror movies 'DAYBREAKERS' and 'UNDEAD'), and it was written by Josh Stolberg and Peter Goldfinger (the duo also co-wrote the slasher flicks 'PIRANHA 3D' and 'SORORITY ROW'). The film stars Matt Passmore, Callum Keith Rennie, Cle Bennett, Hannah Emily Anderson and Tobin Bell reprising the title role. I was a big fan of the first three movies in the franchise, but I was less impressed with the later sequels, and I'm even less impressed with this new one. 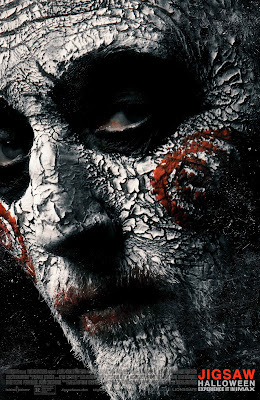 When new victims of a twisted game begin showing up dead, it appears that the deceased serial killer John Kramer, also known as Jigsaw (Bell), is responsible. Detectives Halloran (Rennie) and Hunt (Bennett) must find out who's really responsible, but all of the evidence keeps pointing to Jigsaw though. A doctor, named Logan Nelson (Passmore), becomes Halloran's prime suspect, but he maintains he's being framed. The whole time new captives desperately try to survive Jigsaw's psychotic game. The movie is full of brutal violence, and complicated plot twists (like the other 'SAW' films), but none of it seems fresh or clever anymore. The whole movie just seems like something we've already seen many times before, and I really wanted to see a lot more of Jigsaw in it too. For me the film is pretty disappointing, because I was a big fan of the first three movies and I was really hoping this new installment could recapture some of that same feel. It actually turns out to be one of the weaker horror films released this year (which has been a great year for horror actually), and I really wish I didn't have to say that too. Fans of the series will probably be disappointed, if they're anything like me that is, at least.